?Action ? without blood and thunder! Adventure ? exciting but human! Fantasy ? but with a humorous twist!? 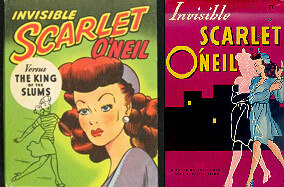 Who is the Invisible Scarlet O?Neil? Simply put, she is the first super-powered leading lady to appear in comic form. On June 3, 1940, creator Russell Stamm introduced Scarlet in the funny pages of the Chicago Daily Times and began to show the world what a super-powered woman could do. 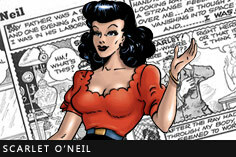 As the name of her strip suggests, Scarlet only possesses one superpower - she can become invisible. She acquired this ability by curiously putting her finger into a weird-looking ray of light emanating from one of her father?s experiments. After a while, Scarlet discovered that she could become invisible or visible by pressing a highly-sensitive nerve on her left wrist. Though it would be the only power she obtained from the accident, that one ability would take the character pretty far. Within a few months of her debut in the daily paper, she also appeared in Sunday strips, and her adventures were reprinted in Famous Funnies comic books. It is estimated she appeared in over 100 newspapers around the world in the middle 1940?s. She would also be the main subject of a couple of ?Big Little Books,? and an illustrated prose novel published by Whitman Books. Figures of Scarlet and other characters from her adventures were available as paper doll cut-outs and unpainted plaster figures. She was a back up feature in Black Cat Comics and eventually starred in her own monthly book from Harvey Comics. Stamm?s ability to adapt Scarlet to the times led to the success of the strip throughout the 1940?s. However, things were changing going into the next decade. 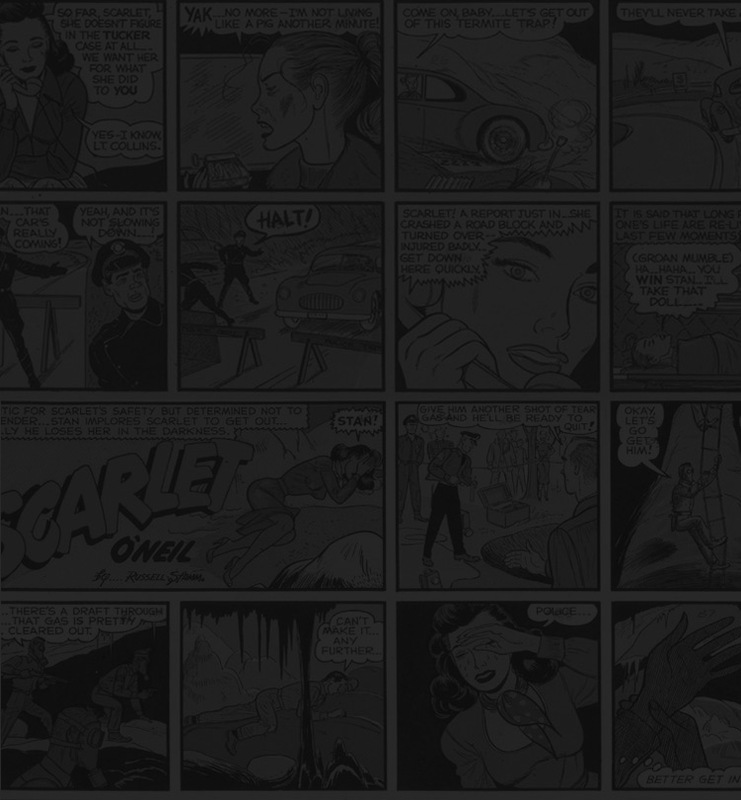 In the 1950?s, female action heroes struggled to survive and Scarlet was no exception. By 1955, the only female action hero to star in her own comic book was Wonder Woman. Stamm tried desperately to save Scarlet by removing the word ?Invisible? from the strip?s title and adjusting the strip for a new audience. Though she still was featured in dramatic endeavors, she did not frequently use her powers of invisibility. Most of her tales during this period were similar to that of a soap opera rather than high adventure. In 1953, Stamm introduced a new character to the strip, Stainless Steel ? a Texas sheriff with blonde hair and superhero physique. He possessed no powers, but that did not hinder his popularity (in fact, it might have helped it). In less than a year, the strip was renamed to ?Stainless Steel? 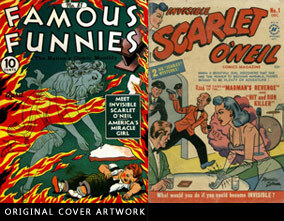 and Scarlet appeared from time to time until Stamm ended his comic strip career in 1956.